This article refers to the language. For the CreationWiki in that language, see Hebrew CreationWiki. For other uses, see Hebrew (disambiguation). Hebrew (עברית, Biblical ‘Iḇrīt, Modern ‘Ivrit) is the name given to the language and/or persons claiming descent from Abraham, Isaac, and Jacob, however the term "Hebrew" originally denoted the descendants of Eber. The language is one of the Semitic language family, which also includes Aramaic, Arabic, Maltese, Syriac, and Amharic. While historically spoken as the language of the Torah and Jewish prayer books, the Hebrew language has been revived in modern times as the official language of Jews in Israel. It is the only language that is common to all Jews, and the only one that can be properly called the "Jewish" language. In the Bible, the Hebrew language is called יהודית, Yehūḏīt (the "Judaic language" or the "language of Judah") because Judah (יהודה, Yehūḏāh) was the surviving kingdom at the time of the quotations (Isaiah 36:13; 2 Kings 18:26). In Isaiah 19:18, it is called שפת כנען, Saphāh Kānāʻan ("The Language of Canaan"). It is the classic language of the ancient Canaanites, used by most of the writers of the Old Testament (except for parts of Daniel and Ezra). The Jews have long called it the לשון הקודש, Lashōn HaQōdesh ("The Sacred Language") as the scriptures written in this language were considered sacred. Hebrew Papyrus - containing the Ten Commandments and the Shema Yisrael prayer. Originally dated to the 2nd Century AD, but subsequent reappraisals have pushed the date back to the 2nd Century BC. Biblical Hebrew, sometimes called Classical Hebrew, is an archaic form of the Hebrew language, in which the Hebrew Bible or Tanakh was written, and which the ancient Israelites spoke. The surviving literature in classical Hebrew includes the Bible, the Midrash, and the works of Maimonides. Non-creationists commonly classify Hebrew as an Afro-Asiatic language, and suggest that that family has its origins in the 8th millennium BC. Yet all authorities agree that Hebrew had its origins in the country of Haran, an account consistent with Genesis 11-12 . One of the earliest known works written in Hebrew is the Gezer calendar, written in an old Semitic alphabet very similar to the Phoenician alphabet that formed the basis of the Greek and Latin alphabets. The Gezer calendar currently dates to the 10th century BC, or the reigns of Kings David and Solomon. In 586 BC, after the Fall of Jerusalem, the captive Jews began to speak Aramaic, the official language of the Babylonian empire and later of the Persian empire, after Cyrus the Great conquered Babylonia and essentially adopted its language. The Jews continued to use Aramaic after the Restoration, and Aramaic was their common vernacular at the time of Christ. Following the Diaspora, or the events surrounding the destruction of the Second Temple of Jerusalem in 70 AD and the evacuation and renaming of Judea in 135 AD by Emperor Hadrian, even Aramaic gave way to the languages spoken in the regions where individual Jews had been deported. Hebrew continued only as a liturgical language, one that rabbis were required to learn in order to read and understand the Old Testament in the original. The efforts of the Masoretes, the preservers of the Masoretic text, were critical in preserving the most extensive ancient Hebrew manuscript in a form remarkably close to the original. All "autographs" of the Bible had been lost by that time, and the Dead Sea Scrolls would not be discovered for another eighteen centuries. Modern Hebrew is the Hebrew variant presently spoken in Israel. It is referred to as modern to distinguish it from its classical variant. The name of Eliezer Ben-Yehuda has an inextricable association with modern Hebrew. Without him, modern Hebrew might not today be spoken. Also, and more importantly, he more than any other man made Modern Hebrew what it is. Beginning in 1881, Ben-Yehuda, a Byelarussian émigré who anticipated (and perhaps provoked) the First Aliyah (1882-1904), campaigned assiduously to adapt classical Hebrew for use in normal everyday conversation and to encourage Jews everywhere to speak it. Ben-Yehuda had two principal goals. One was to convince all Jews to speak Hebrew as a primary or "native" language, not as a secondary or liturgical language. 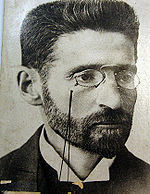 Ben-Yehuda had been told that a common language was one of two necessary marks of distinction for a self-determining people. When others told him that the Jews had no common language, he declared, "We shall create one!" He did not actually mean to create an entirely new language, but rather to convince Jews to use a language that they already knew how to read, for a much wider purpose than that for which Jews used it at the time. Orthodox Jews often opposed his efforts, regarding as blasphemous any effort to speak the Sacred Language in everyday contexts. As a further complication, Ben-Yehuda had been nonreligious, or even anti-religious, ever since he had fallen in with his heretical professor at his yeshiva in Byelarus. The Orthodox community knew this and therefore regarded all of his ideas with suspicion. In addition, members of the "Odessa School" and certain scholars who were part of the Second Aliyah (1904-1914) took exception to Ben-Yehuda's newly coined words, which they considered "artificial." But Ben-Yehuda pursued his goal with single-minded attention, by first insisting that everyone around him (and especially his wife and children) speak Hebrew exclusively and then by various other methods calculated to popularize, refine, and promulgate the language. He published the first all-Hebrew newspapers, promoted the intensive model of Hebrew-to-Hebrew instruction in Jewish schools, established the Hebrew Language Council in 1890 (the forerunner of the present Academy of the Hebrew Language), and began work on the seventeen-volume Complete Dictionary of Ancient and Modern Hebrew that his second wife and son would finish after his death. Ben-Yehuda lived to see a generation of Jews grow up in British Mandatory Palestine having learned to speak, read, and write Hebrew as a language of normal conversation and correspondence, and thus more than a liturgical aid. On November 29, 1922, British authorities declared Hebrew to be the official language of the Jewish people of that land (which would later be known as the State of Israel) less than three weeks before his death. Ben-Yehuda's various dailies ceased publication at the beginning of the First World War and never resumed. But Ben-Yehuda's Dictionary remains today one of the most important references for modern Hebrew, though the Academy of the Hebrew Language continues to function as the arbiter of proper Hebrew vocabulary, grammar, and usage. 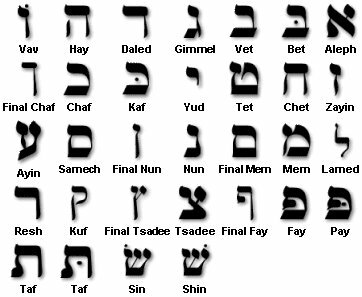 Hebrew has its own alphabet, or alephbet, of 22 letters, all consonants—except for letters א, aleph and ע, ayin, which are silent. Several Bible passages, most notably Psalm 119 , are alephbetical acrostics. From these, Biblical scholars have derived the order of the letters. Hebrew is written and read from right to left, presumably because at the time of the invention of its classical form, written documents were chiseled in stone by a method that involved holding the stylus, or chisel, in the left hand and striking it with a hammer held in the right. The right-to-left letter order allowed a scribe to see the words he had written as he worked. Hebrew is considered a phonetic language; one speaks it as written, according to conventions that appear to stand inviolate and consistent. The English language is notoriously inconsistent by comparison. The א and ע are silent. With the exceptions described below, all other consonants are pronounced much as the first letters in their letter names indicate. Many consonants appear to be pronounced alike; the more likely explanation is that the differences in pronunciation of some symbols (like ט and ת) that existed in classical times are much too subtle for modern scholars to discern. Many of the consonants have alternate forms that either depend on their placement in a word or dictate different pronunciation. Specifically, the letters כ ,מ ,נ ,פ, and צ have final forms (ספיתים, sofitīm) that always appear at the ends of words, and regular forms that appear within or at the beginnings of words. Note that the ch sound is guttural, produced from the throat, like the ch blend in the name of Johann Sebastian Bach. The ש always has the dagesh, but with two alternative placements. ש with the dagesh placed above the right stroke is pronounced sh (e.g., Shibolleth); with the dagesh placed above the left stroke it is pronounced s (e.g., Sibolleth). A terminal ט or ת is more properly pronounced more like th, i.e. a more liquid and slightly more aspirant sound than the fricative/plosive t.
The dagesh placed within some letters served to double them. A speaker always inserts vowel sounds between consonants. Furthermore, the speaker uses one vowel sound at a time. Hebrew has no such combinations as diphthongs or consonant blends. Hence the use of א and ע, the silent consonants, which indicate an initial or a terminal vowel, which otherwise would not be permitted. The vowel sounds do not correspond to the English language vowel sounds perfectly. They are ah, eh, ee, oh, and u. They do not have the alternate "short" and "long" forms known to English. Classical Hebrew had no vowel symbols. Those already fluent in the language could readily discern what vowel sounds were present in a word, either from experience or by following some fairly simple conventions. The Masoretes, the keepers of the Masoretic text, developed a set of vowel symbols, or points, that they placed below, above, or between the consonants, to aid in pronunciation. The Academy of the Hebrew Language today deprecates these symbols, and they do not appear in any modern Hebrew literature. Only in the Masoretic text do they appear. Modern Hebrew speakers have achieved the level of fluency and experience that allow them to supply the proper vowels without the aid of the Masoretic points. The letter ו normally was a fricative. However, in some contexts it fell silent, and the vowel sound following it was understood to be either open (oh) or closed (u). This variant usage perhaps explains why the Latin "v" was originally pronounced like "w."
Hebrew is heavily dependent on roots. Roots provide consistency of meaning between and among the various parts of speech. More-complex words in classical Hebrew are composed of combinations of simpler roots. Presumably the Academy for the Hebrew Language follows the same principle when coining words in modern Hebrew. Hebrew recognizes three grammatical persons, called speaking, present, and hidden. These terms correspond roughly to the English personal pronouns I/we, thou/ye/you, and he/she/it/they. Some nouns are always plural in form. The three most common are panīm (face), Shāmạyim (skies, which is actually dual), and ʼElōhīm (God). Hebrew words have a masculine form and a feminine form. A terminal ה usually indicates a feminine form. The masculine plural ending of all nouns and verbs is ים, pronounced -īm; e.g. nevihīm, meaning prophets. The masculine dual ending is spelled the same way but pronounced yim. The feminine plural ending is ות, pronounced -ōt; e.g. bamōt, meaning high places. However, not all plurals having feminine endings are feminine. Feminine dual endings do not appear. The neuter gender of Latin and Greek is unknown. A terminal י means "my" or "mine." An initial ה becomes a definite article adjective. A terminal ה denotes the feminine form of a noun or verb. Punctuation in modern Hebrew is almost identical to that in English and other Western languages. Classical Hebrew uses fewer punctuation marks. Classical Hebrew also substitutes a sof pasuq, a colon-like character, for the period, and opens a quotation with a subscript quotation mark, similar to the German language. The Hebrew hyphen character, or maqaf, appears at the top, not in mid-line. Whereas English and other Western languages use a period at the end of an abbreviation, Hebrew uses an apostrophe (geresh) instead. A Hebrew verb must agree with its subject in person, number and gender. Sometimes the number and gender of the object of the verb influences its form, pronunciation, or both. Hebrew verbs have only two tenses, the perfect and the imperfect. The term perfect denotes completion, and thus the perfect tense denotes completed action, while the imperfect tense denotes action that is ongoing or otherwise not completed, including action that has not yet commenced. The Hebrew perfect tense corresponds roughly to the English past, perfect, and pluperfect tenses, while the imperfect corresponds roughly to the English future tense. The imperfect tense is also the form for handling indirect commands. "Let there be light" is the first example given in the Bible. Hebrew participles are sometimes treated as a third tense, roughly equivalent to an English present progressive form. At other times, participles are treated as verbal adjectives, either identifying the performer of an action or describing a person or thing by the action that it commonly performs. Participles must agree with their subjects in gender and number but not in person. Hebrew imperatives are also treated as a separate tense, not a mood. An imperative verb must agree with its subject (the one to whom the command is given) in gender and number but not in person. The Hebrew imperative handles direct commands; indirect commands and recommendations are best handled by the imperfect tense. Transitive verbs in Hebrew have three voices: active, reflexive, and passive. These correspond roughly to the active, middle, and passive voices in Greek. The rough English equivalent of the reflexive voice is the active voice used with compound personal pronouns (the "self" words). Hebrew verbs appear in three moods: simple, causative, and intensive. The simple mood is a basic statement of direct action (complete or incomplete). The causative mood expresses indirect action; the subject of a verb in the causative mood is not the doer of the action but the person or thing that causes that action. The intensive mood expresses intense action. Any verb can therefore have a simple and an intensified meaning. Thus the English verbs "cut" and "slashed" are actually the same verb in Hebrew, expressed in the simple and intensive moods, respectively. The subjunctive mood is unknown in Hebrew, and is handled by the imperfect tense (see above). Hebrew infinitives have very little in common with their ancient Greek or modern Western counterparts. Hebrew has two types of infinitive, called the construct and the absolute. Construct infinitives identify simple action and are treated similarly to the simple mood. Absolute infinitives intensify the verbs that follow them. Example: "You will surely die." Genesis 2:17 (NASB). Modern Hebrew has adopted Arabic numerals and most other mathematical symbols (except for an alternative addition operator, ﬩). By convention, mathematical terms and expressions are written left to right. Classical Hebrew used letters to represent the numbers. The first nine letters in order carried the values 1-9; the next nine carried the values 10-90; and the remaining four letters carried the values 100-400. (In the years following Hillel II's calendar reformation, the final forms ך ,ם ,ן , ף, and ץ were assigned the values from 500-900.) Classical Hebrew used a geresh (see above), written to the left, as a thousands separator. To distinguish numbers from text, Hebrew used a geresh written to the left (i.e., following) of a single-character number, and used gershayim (a type of double quote mark) to the right (i.e., preceding) of the terminal character. Example: תשס"ד, which stands for 764. Numbers between 1 and 999 were written with a hundreds character first, then a tens, then a ones. Before the use of final consonants to represent 500-900 (a convention that the Masoretic text does not observe), classical Hebrew would represent the higher multiples of a hundred by beginning with tav (400) and adding as many other "hundreds" characters as were necessary to produce the quantity desired; hence תק for 500, תש for 700, תת for 800, and תתק for 900. Numbers ending in 15 or 16 required special handling: 15 was written טו for 9 + 6, and 16 טז for 9 + 7, in order to avoid using the sacred Tetragrammaton to represent a number ending in those quantities. In addition, the letter order might change in order to avoid spelling a word having a strong negative "charge," or even to give a number a strong positive "charge." The numerical values of the letters formed the basis of the checksum system used as a quality-control measure to insure the fidelity of any copy. The classical numbering system persists today in some implementations of the Hebrew calendar. Such implementations commonly drop the thousands character of the year for contemporary documents. גת שמנים, Gāt-Shemanīm ("olive grove", Anglicized to "Gethsemane"). 11th century manuscript of the Hebrew Bible with Aramaic translation (Targum). ↑ 1.0 1.1 "Hebrew language," <http://www.wordiq.com/>, accessed September 24, 2009. ↑ The only translation of the Hebrew text that was even remotely authorized was the Septuagint, a project of the Great Library of Alexandria. The Masoretes undertook their project after having rejected the Septuagint as profane. ↑ 3.0 3.1 3.2 3.3 Naor M, "Flesh-and-blood Prophet," Haaretz, 13 September 2008. Accessed 24 September 2009. ↑ Kantorwitz L, "Eliezer Ben Yehuda and the Resurgence of the Hebrew Language," The Jewish Magazine, December 1999. Accessed September 24, 2009. ↑ 6.0 6.1 "Alphabet by the ISBE, hosted on the Torah and Israel Resources Gateway. Accessed September 24, 2009. ↑ 7.0 7.1 Texin T, Hebrew Numbers," 2003. Accessed September 25, 2009. ↑ Montagu S, "The Hebrew Numbering System," 2005. Accessed September 25, 2009. ↑ That last exception to the numeral-order rules might have given rise to misguided attempts at constructing a Biblical numerology, or the assignment to numbers of meanings having mystical significance for which no Scriptural warrant exists, other than the coincidental use of the same symbols to denote a given number and to spell a given word. ↑ See, for example, Arutz-7 Israel National News (Hebrew version). Ha'Aqademia la'Lashon ha'Ivrit (The Academy of the Hebrew Language) official site. Benner JA, Introduction to Learning Hebrew, Ancient Hebrew Resource Center. Parsons JJ, Hebrew for Christians. This page was last modified on 3 August 2015, at 09:25.